I have heard it touted at the 'best R-rated female comedy of all time'...which clearly set my expectations high above what they should have been going in. Duh Jes, it's not like there is any other to compare it to. 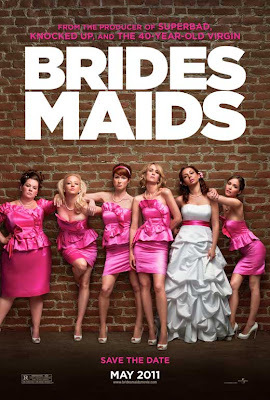 Bridesmaids was not as terrible as I thought it was going to be...that being said it wasn't anything like I thought it would be either. I went back and watched the preview I saw before going in and half of the lines used were not even in the movie...not to mention that the preview leads you to believe that the ladies are going to Vegas for a bachelorette party to try and replicate The Hangover with vajayjays. Not the case either. Kristen Wiig plays the maid of honor, Annie. The rest of the bridesmaids play small to minuscule roles in the whole scheme of the story, which is all about Annie and her super lame bad fortune life. The wedding and the "bridesmaids" aspect was more of a backdrop to Annie doing a little bit of self discovery in her life. Wiig was good...I quite enjoyed her, but I felt like they were playing off the whole wedding/hangover bit...when it was more about the maid of honor than anything else. As far as the film being the funniest thing ever...um yeah, no. I think I laughed a couple of times, but overall in the parts where you knew they were meaning to be funny it was just awkward. But Wiig is one of the main writers on the film and you know what else she works on? Saturday Night Live. Which makes perfect sense to me because maybe once every 6 months the folks at SNL will create a skit that is actually laughable, but they are few and far between. I was expecting it to be less of a chick flick and more of a comedy, but in the end it was the same old chick-flick-happily-ever-after-Hollywood-ruining-females-expectations-of-men-and-relationships movie. I think the other bridesmaids, given the opportunity, could have made the movie much more enjoyable had they got more screen time (and I mean everyone except Helen). They unfortunately didn't...which is incredible because the movie two hours and five minutes long.